Congratulations to our very own, Jeff Givens! 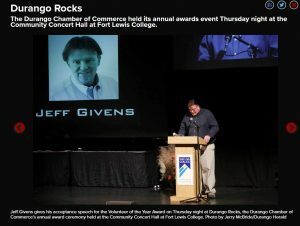 He received the Volunteer of the Year Award by the Durango Chamber of Commerce last night at the “Durango Rocks” celebration. In case you didn’t know, Jeff is a wealth of knowledge about weather and specifically the weather in and around the Durango area. Thousands of people look to Jeff to provide timely updates on our local weather and have grown to love and appreciate all his efforts over the past few years. He provided significant details and important updates to the local community during the 416 Fire last Summer and many people relied on and trusted Jeff to aid in planning efforts for everything fire-related. Read the full article in the Durango Herald here.